This year for teacher appreciation week we will be giving each teacher a “days of the week” pill box filled with little treats and sayings. I found the pill boxes at the dollar store. Fabric covered tacks fill one of the compartments to tell them they are sharp! These are simple to make with glass gems (floral department at the craft store), E600 craft adhesive, a 3/4 inch hole punch, 3/4 inch magnets and decorative scrapbook paper, wrapping paper and or magazine scraps. First punch out a circle and glue it to the back of the glass gem. I removed air bubbles by moving paper in a circular motion to distribute glue evenly and then pressing hard. Allow to set. Next glue the magnet to the back of your papered gem. I found it necessary to sort my glass gems to find the largest ones with no scratches or imperfections. If your glass gems are smaller try using a 1/2 inch hole punch and 1/2 inch magnets. Teaching my child each day through. As a teacher, you’re one of the best! 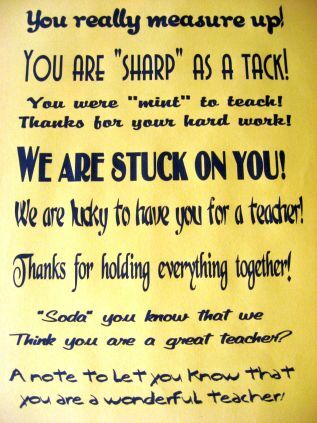 Hopefully our teachers will feel appreciated each day! I have 7 grandchildren and I love to make gifts for all their teachers. Thanks, this is the best!!! I am a variety of volunteers along with beginning a fresh program in our area. Your web site provided us with helpful information to art upon. You will have completed the solid task as well as our own entire community can be thankful to you personally. Love, love, love this idea!! I think these little gifts send a message of "thank you for all the little things you do that add up to big things for my child." Thank you for the innovative idea . I am saving this for a future gift. These nasty postings really brought tears to my eyes as I just finished making mini fruit kebabs for the teachers and was prepared to sew a tissue pack cover for tomorrow. I don't spend very much money on gifts for my children, so I certainly can't do much for others, but I hope that any token of appreciation is indeed appreciated. Thanks for your great inspiration. I love your site. God bless you. I think this is a fabulous, cute idea. Some people need to remember that some people can only afford to do crafty things like this, especially those with multiple children or have just fallen on hard times. Cheers to you teachers that truly appreciate things like this. I always try to remember the P.E. teacher, music teachers and art teachers too.....it can really add up when you include all of them too, but you sure don't want to forget them. I do like the idea of putting a heart felt note/letter with anything or just by itself. Have a wonderful summer everyone. Any teacher who receives a "cheesy crafty" gift obviously has no idea how much time, effort, and thought goes into making them. With that said my best friends sister was my son's kindergarten teacher and I did ask her what type of gift would be preferred as a Christmas gift. She did express the fact that an item that can be used in the classroom in some way was preferred over "personal" items, but I also know that we live in one of the poorest counties in our state and most of our teachers struggle each year just to have basic school supplies for their students. In our county these pretty extras are placed low or non-existent on the purchasing list because the teachers are spending entirely too much on supplies that parents either cannot or will not purchase for the students. With this gift you are covering several levels of thoughtful gifts. One, the item is filled with usable, but still fun and pretty items. Two, the gift required some effort to acquire and make so it shows the time and thought put into it. Third, it offers expressions of appreciation. If you have too many mugs, etc then feel free to re-gift them to your family and friends or how about you get a little crafty yourself and come up with unique uses for those items. While Ellie and others did not say that they showed their discontent with the students or the parents I'm afraid that since there was no sincere appreciation it was probably terribly obvious. I don't necessarily want the dandelion blooms my children constantly "gift" to me on a daily basis, but they are 100% sincere in the desire to please and surprise me and I shudder to think that someone would squash that smile and pride in a child. A gift is just that...a gift. You don't deserve it, you don't have a right to it, and to be unappreciative is in very bad taste and I feel shows a great lack in character, grace, and elegance. If you do not like the gifts then feel free to notify parents on the first day in writing that you will not accept them for whatever reason you can find that sounds better than "I just don't appreciate them." That way no parent spends time or money on one and a child doesn't get crushed by your lack of enthusiasm in acceptance. May God richly bless you in your mug and cheesy crafty item filled existence. WOW maybe some folks should get out of teaching if they are 'tired of cheesy crafty' gifts. I have taught for 22 years and recently had to take sick leave as I battle cancer. My high school students made me cards and posters to put up in my hospital. My past students even made cards using our inside jokes like the Lab Peacock and Julius Sumner Miller's "Physics is my business, your business is to get better" etc..- Crafty, cheesy ? you bet & I enjoyed everyone of them and the encouragement they provided. Poor, poor Ellie and Patty. It made me so sad thinking about how unhappy they must be to not appreciate a little person's gift (regardless of whether they felt the need to donate it to a needy person or place if it wasn't needed) I'm going to get to work on two things: 1.) this adorable pill box and 2.) saying a prayer they both find peace and joy in the little things life offers. They are truly what matter. I love this unique idea. The possiblilities of what to include in it are endless, and the container can always be used for a center game. I've been teaching for 25 years, and have received many different tokens of appreciation during that time. I have enjoyed every single one of them. That includes the orange seed that a child gave me because she knew I loved oranges. She said that I could plant the seed and have as many oranges as I want. What counts is the kind gesture, not the actual item. Please don't let any of the comments posted here discourage you from encouraging a teacher. Appalling! I was so shocked when I read Ellie's comment. How ungrateful and uncaring can a person be?!!! While I do know a few teachers who would think the same thing as her, I do believe most teachers would be thankful for the time and energy put into this crafty idea; not to mention thought and love that was put into it. Our district is one of the poorest in this half of the state. Many of our children's families struggle with simply making ends meet. Gifts for the classroom are greatly needed. These could be crafting supplies, pencils, sharpie markers, crayons, rulers, books, binders, etc. 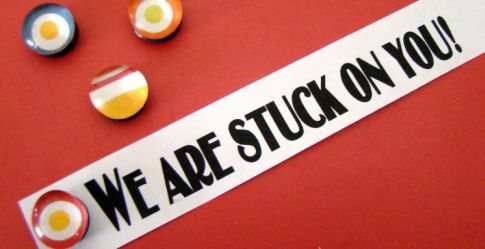 The ideas in this craft are wonderful in the way that teachers need to pin things to their bulletin boards, hold papers together, and mark where students are in their reading books or placing notes in your lesson plans. Some of us are fortunate to have magnetic boards in our classrooms where we need strong magnets to hold things to the board. Most teachers in my school will at one time or another use the soda vending machine. The coins would be put to good use - the teacher can choose to buy soda, water, or juice - what ever flavor they desire and whenever they want it. Just the thought that a child or their parent wanted to thank me for the work I have tirelessly performed is exciting. Yes we could use a good letter to the Principal or the Human Resources Director and we could use a gift card to whatever place you desire, but its not the only thing in the world that counts. Prices of a gift received should never be equal to your appreciation. This is a really cute idea. My preschool staff would be tickled to receive this. They get a lot of mugs, candles and lotions- enough to open a store which is why homemade is great. As a Director at a school we run a very tight budget and while I love to splurge on stuff like post-its (yes- it's a splurge) I cannot always buy these cutesy things for the staff. My girls would love this. The would continue to refill it with treats or use it for math sorting or surprises and stuff. I would continue to refill it myself with bite sized chocolates and notes just to show them we care. Moms thank you for all your crafts, notes and cheesy gifts- please do not ever think they are not appreciated. They truly are. Parents do not need to spend $$, just put thought and love into it. Love this idea and so many of the ideas on this website. I was in charge of Teacher Appreciation Week for many years (and still am) and we would look for ideas to give the teachers and staff (75 people) a daily treat. Although some of the above posters sound as though they were born with a silver spoon in their mouth, most of us have to work with a slim budget. All of the teachers were more than elated with the clever ideas and thoughts. Although my daughter has moved on from elementary school, the teachers there still comment on the gifts and treats they received while I was there. I, myself, have been a dance teacher for more than 35 years and I have received some of the most "amazing" gifts. When you see the child run in with their gift for you and their eyes are lit up, you can't help but appreciate it!! I have a few things to say. First of all, this is soooooooo cute...I want! Adorable! Wish I could have given this to my teachers!! Second, I KNOW teacers appreciate gifts... they my not cost a lot of money or something they would have seen and bought or made, but they would still find a place for them. When I was in elementary school, I made my teacher a name poem. You know, where you write their name down the page and then come up with kind words that start with that letter in their name. Well, everyday at school I saw that hanging up in the classroom. And third, I want to speak directly to Ellie. Ellie, I don't know who told you that a gift like that is not appreciated, but you need to wake up and smell the roses! I mean really, these are tough economical times and some people don't make a ton of money so they don't go and buy tiffany earrings for Ashley's favorite teacher! A gift is a gift no matter how well made or how expensive. Plus, what teacher can't use post-it notes, and magnets, ect? With a clever saying, too. Oh and one more thing, call a therapist and buy your self something nice for Christmas. Whatever you do, do NOT buy a mug... or an apple realated item. I like the idea of an I think of you gift and feel this is appropriate....for me. I loved doing things for my sons teachers when he was young and tried to give thought to what the teacher could use -- never bought an apple related gift or mug. However, it got to the point at our school that a week of gifts was expected and children who couldn't do it were embarrassed. How many jobs are gifts of any type expected -- do you give them for your banker, postal carrier, property tax assessor for doing their job? A gift should be from the child's heart and in the form of a thank you letter, not 'stuff'. I subbed and heard how teachers talked about gifts and they often asked for kids to be in their class because they knew the mom did the best gifts. I love this cute idea though -- it's a fun gift. And teachers need to remember gifts of any kind cost MONEY and TIME from the parents. Love the idea and I was a former teacher. Cheesy or not, it is a token of appreciation. It was a rude comment that should never have been made. Where was her sense of humor or feeling of gratitude? Wonder what her attitude is in her classroom? Thought this was a great idea and was preparing list to make, but then read some comments and started to question myself. However, I too think any teacher would LOVE to receive these items. They can all be used and with budget cuts in schools, I think it would be useful. Wow, Ellie. I pray that my children NEVER have to sit in your classroom. I almost started second-guessing all of the appreciative gestures that my children and I do for their teachers. I have a great appreciation and love for my kids' teachers and we have fun showing them how much we love them. Why would you try to take that away from all of the teachers that DO appreciate that? Maybe it's time for you to retire. I did my own rendition of this idea about 3 years ago and am repeating it this year for my boys' teachers. The teachers always love them. I have been very involved in my children's school (PTA Pres, ect.) and I think this is SO CREATIVE and a wonderful token to teachers. ANd to the teachers who do not appreciate the love that goes into a project such as this perhaps are burned out and should find a new career...seriously! THANK YOU for giving us such a unique cute way to thank our teachers on a budget that many PTA's are on! WAY TO GO!!! YOU ROCK!!!! Thanks for helping SO many of us!!! I never comment on blogs but Ellie's comment made me so mad I had too. Clearly she was not taught the value of an appreciative gesture no matter how small. I am sad that there are people in the world like her. I LOVE this idea and all your others and believe that when appreciation is expressed it should not matter how it is packaged. Thank you for your creative ideas! Ellie, I hope you can some therapy as you clearly have some deep issues. Fabulous idea!! I linked your post to my blog because I wanted to share the cuteness. I hope to get the supplies this weekend so I can send it in early next week to my kids teachers. Thanks for the printable link as well, I am super excited about this one. As a teacher of 10 years, I have to say that when any of my students bring me a gift, ANY gift I am soooo appreciative! :) I teach high school, and as a rule students don't tend to give as many gifts to their teachers, so each and every gift is a treasure! I absolutely love this idea!! Thanks for sharing it! I frequent many blogs and have read many comments that I found to be in poor taste, but have never felt compelled to comment myself. Until now. I teach second and third grade and am appalled at some of the comments written by fellow teachers. Shame on them. No one should be made to feel bad about giving a gift of appreciation. Seriously? You are telling people how you want to be appreciated? Is that the message that you share with the children in your care? I've been teaching for 20 years and have opened more than my fair share of mugs and apple related gifts - each one delivered by a beaming child. Families are busy and stressed out - i welcome any token of appreciation. Let's all be grateful for the tokens of kindness shown us. I am a teacher who works in a school with 100% low income students - I would be happy to receive ANY gifts from my parents and students! In my 6 years of teaching, I can count on one hand the number of gifts I've received, but there is no excuse for being ungrateful for any gift given by a child! This gift would not only take a lot of time and effort, it provides things that all teachers use on a daily basis and cute versions of them! I would be proud to receive this from a child who had taken the time and effort to create simply for me! Wow. I've been teaching for 18 years [high school] and am grateful for each and every gift I've ever received - especially the handmade ones. Those who have made harsh comments about this gift are obviously spoiled and probably work in fee-paying schools where rich kids give them gift cards to exclusive boutiques. Seriously, people, didn't anyone ever teach you that if you can't say anything nice [especially to a stranger] then just shut the hell up?! Love that idea. I would love to get this box of appreciation! And I am so disciplined that I would really only open each day as it happens. I'm such a dork!! I really love this idea. I taught for 10 years and I have been a stay at home mom for the last 10 years...so I have been on both sides of the classroom. I know my children's teachers well enough to know that they would think this was a darling idea. If you think you have a teacher who is going through a rough year (financially or emotionally) maybe a parent could tailor the gift and lean more towards a grocery store gift card etc. But for the most part I can't imagine too many teachers who woudln't say..."wow...someone really put a lot of creative thought, time and energy into this whimsical gift." I have been a teacher for 16 years and I absolutely love this idea. You teachers who have posted negatively about this are RUDE. I receive joy from seeing my students' faces every day. This gift would hands down make my day. Cindy-keep those wonderful ideas coming! This craft took A LOT of thought so poo-pooh to the haters out there who criticize it. People read your blog to get wonderful ideas to share out of love. Period. If they don't like what they read, then they should click the "x" button and go on. Whether you're a teacher or not, any kind of gift should be appreciated. We should all be so lucky to get a macaroni necklace :) Your blog is wonderful! Hey Cindy! I just wanted to let you know that I featured this gift idea today on my blog! I'm doing a whole series of Teacher Appreciation Ideas and I thought this was so cute! I AM A TEACHER and I LOVED THE THOUGHT OF THIS!!! Thanks so much for all of your inspiration! Please, please, please keep it coming! I just stumbled upon your site. Love this idea! I look forward to checking out the rest of your site! "Teacher Appreciation" day is next week at my son's school. I was planning on doing something fun and practical. After reading some of these responses from teachers ... it may not be worth the effort. I might just send a note and gift card. I agree that one can only get so many mugs, but one can always put a plant, candy, toothbrushes or whatever in the mug. What I am saying is ... gosh ... how sad to feel this way. Life can be so hard as it is without enjoying the "little" things. Okay! I like others am embarrassed to call myself a teacher after some of the comments written. What is your motivation people? Are you REALLY teaching to be "rewarded" with words or gifts? Come on. If someone gives you a gift, macaroni necklace, cute pill box craft, note on crumpled paper or otherwise...BE APPRECIATIVE! How about people donating to a charity or a book to the local library if you feel the NEED to be given something for your exemplary work (that's sarcasm). I say carry on OH CRAFTY ONE! These are cute and shame on others for poo-pooing it. That is ridiculous! As a teacher myself, I can say a gift like this would tug at my heartstrings. Ellie, much of what you say abot writing notes and heartfelt sentiments to a teacher is correct -- there is never a substitution for hearing and reading those words of gratitude. But the time it takes to put together a sweet gift like this is clearly filled with a lot of love and thought. ANY teacher who truly has her heart in her job would see this. That's what Teacher Appreciation week is all about -- it's not about receiving gift cards and certificates. It's about realizing how much what you do means to so many families. I am a veteran teacher and I love this cute idea! This would be something the teachers at my school would be showing colleagues because it is so crafty and clever. Thank you for the thought that went into a gift that is not necessary but certainly appreciated. What a fun idea! Cindy, even the CONTAINER is useful on this gift (for medicine or vitamins or just storing little things). I love this idea for other people, too, not just teachers. Thanks for taking the time to share your idea. Also, if teachers never hear enough how well they are doing, then they should love getting a week's worth of that message from at least one student. My husband is a teacher and any kind of school supply gift makes his day. Oops, I wasn't finished. ;) I got fired up and hit the submit button by accident! ! What I wanted to say is that I think if a parent (and child) takes the time to make a teacher something, then the teacher should be grateful. Period. A gift is a gift. And the other poster saying they were dismissive of cheap gifts.. Seriously? I don't expect our teachers to keep their "macaroni" necklaces for 30+ years until they retire, but a smile and a "thank you" are more than appropriate. Ok, so I've let this stew for a while. I was so offended by Ellie's post that I just didn't even know what to say. So I didn't say anything for months. Until now. I'm not a teacher. I've not had to endure the hardship of receiving countless mugs, cheap bubble bath or any other "undesired" gift. As a teacher, I would appreciate this gift. I can always use tacks, sticky notes, magnets, ect. Especially cutesy one like these mentioned. Cheesy or not, this is still sentimental because the child would have worked on it. I would prefer something like this over lotion, candles, ect. My mom printed this, so my little brother can give this away this year. Thanks for the idea! This is adorable! Small yet meaningful handmade items are always the best! I can't help but think that it would be a safe thing to just ask the teacher what she would like to receive. this idea presented here is very sweet and I know for a fact that there are plenty of teachers out there that would be thrilled to receive it. If you don't think this is the case then just ask. Once a teacher told the families that if they really wanted to give a gift then they could give her a rubber stamp with a fun or positive message or design on it. She collected these stamps and used them as encouragement messages on the children's school work. The truth is that no one HAS to give a gift and if you receive one being grateful and appreciate is also a teaching moment for the teacher ---whatever the gift. If it is from the heart it counts big in my book. As a retired teacher of 36 years in elementary school, I must agree with Ellie, though I would have delivered the message in a kinder way. I used to be dismissive of the cheap gifts, like flamingo bubble bath from the drugstore, or something from the thrift store, even though I realized that it was the thought that counts and not everyone could shop at Nordstom's. I changed my view, and shared it with my student's parents, that gifts for the teacher are not necessary. If they did want to get a gift, the process should be used it as a learning tool so that children will learn the art of gift-giving. Think about what the teacher does that you really appreciate or what you admire about her(him) as a person. Think about something the teacher did just for your child. Buy or make something that highlights your appreciation. Most appreciated gifts: gift cards for everyday items from: Hallmark, Target, Trader Joe's, or the movie. Homemade items, that the student actually had a hand in. Specific notes of appreciation for something the teacher did. Though tangible gifts are wonderful, appreciative letters of a job well done sent to the principal, superintendent, or school board really make a difference! In my retirement, I found I have kept just these kinds of gifts--personal mementos of gratitude. I have no mugs, macaroni necklaces, or paper airplanes with my crayon-drawn picture on them. I only kept the heart-felt letters or notes that specifically thanked me for something I did. My mother-in-law gave me wonderful advice when I was first married. When she gave me a present she said she had really thought about what to buy and hoped I would like it. She told me, "I know what I gave you, but I don't know what you received," meaning that she had given much consideration to my gift but wasn't sure I would appreciate the thought she was trying to express. She invited me to talk about the gift if I was ever in question. We had a wonderful relationship and I miss her dearly. I hope this helps you in choosing gifts for others, including your child's teacher. Wow, Ellie! Did you just finish a year in a classroom of unappreciative kids? After teaching for decades, I still find gifts like this fun and I always appreciate the time the mom, or the child or the two of them took to put it together. A heartfelt letter would be a wonderful addition to it of course, but let's not forget the thoughtfulness that brought a gift like this to you. You are right that teachers are not thanked nearly enough, so why disparage this effort? I hope that you have a great summer vacation and recharge your batteries. @ Ellie: WOW! What a comment! Please tell me what is "useless and cheesy" about quarters, post-it notes and paperclips? Last I checked, all teachers/schools could use post-its and paperclips. And, well, couldn't ANYONE use quarters? If your quarters are useless to you feel free to send them all to me. Pretty sure I can find something to do with your "useless" spare change. You know, I have to say (as the daughter, niece, granddaughter, cousin, friend, etc of teachers) that while a "cute" idea, most teachers would hate this gift. Maybe the brand new teacher would keep it, but year after year of this cheesy, "crafty", useless stuff really wears them down. There is a reason teachers have started asking parents not to get them mugs or anything: Nothing useful ever comes of these kinds of presents. They just take up room. If you really want to show a teacher you appreciate them, give them something they could use and/or help in their classroom. Teachers have more than enough to worry about without having to figure out what to do with useless things like this. And sentimental/heartfelt goes a LOT farther than cheesy, btw. So if you're going to say anything in the gift, write them a letter expressing what you appreciate about them, what kind of influence they've had on your child, etc. A letter just simply telling them why you think they did a good job is 1000% better than your idea. Teachers NEVER hear enough about how well their doing, most often they only hear from people that complain that their children arent doing well enough or that their child's inability to do their homework on time when the rest of the class did is somehow the teachers fault. Teachers almost never hear from the parents that think they teacher is doing well by their child. So next time, instead of spending the hours it took you to put this together, go out and get something useful and then attach a heartfelt letter to it. My son has 2 teachers this year and we were so excited to give these as an appreciation gift. The teachers liked it so much, we got a thank you back each day (one for each gift in the pill box). Too cute! Thanks for sharing your talent! in such an easy way for us to use! This is really, really sad. Thanks Stumbleupon for showing me the most depressing present anyone could ever receive. Does a teacher really need to be encouraged like a mentally challenged child? I love this idea. I have posted it along with a link to your site on my blog. I hope you don't mind. I just love this and wanted to share. We're making these for our Sunday School teachers on Promotion Sunday! Blessings to you! What a great use for those 7 day pill containers. I have a bunch I got free laying around the house. Thanks for the great idea. I hope you don't mind if I use this this year. It is truly the most original and wonderful gift I've seen Don't you ever run out of ideas? I hope not! Thanks so much! Such a cute idea. I think we'll do this for several of my boys' teachers. I hope that when I'm a teacher I get something so thoughtful. I love it! I love your cute idea. Just to let everyone know what my granddaughter, Mackenzie, and I have planned for her 4 teachers this year. We have chosen a garden theme. On Monday, Mackenzie will take her teachers a bouquet in a watering can that I have painted with a saying, Teacher, Teacher, Children seeker, How does your classroom grow? With smiles and tears, Hugs and cheers, And the sweetest girls and boys we know. Tue., we have painted a small rock with the saying attached, A rock in our garden is tacky, but as a paper weight, it makes us happy. Wed. we have painted bugs, butterflies, etc... on wooden baskets.We are filling the baskets with garden supplies, such as, gloves, seeds, garden spade, and other garden things we have picked up. We are attaching sayings to some of the item, like, on the spade, I did you, on the seeds, teachers plant seeds of knowledge to help our children learn and grow, etc... Thur. we have painted a 6" flower pot, included a plastic ziploc bag of potting soil and forget-me-knot flower seeds or flower along with saying, Forget me knot and I will forget you knot. Fri. we had all the kids sign a 11 X 14 mat. We are framing an appreciation certificate and will place the mat around the certificate. On the certifficate we will include something like, Thank you for sowing seeds of knowledge that helped us learn and grow this year. We think you Rock! Also, on Wed. we are taking Subway trays and a basket of mound candy bars with attached saying, our teachers deserve a mound of thanks. Teachers have a thankless job and deserve a pat on the back. Thank you for the cuuuute ideas! I mentioned you on my blog this morning! Wow, way cute idea! We'll be linking to this in the near future! Thanks! as a teacher, I looooove this idea! It is so cute! Love it! Thank you for sharing the idea and all the clever messages to include. Thanks for the wonderful idea. I made one of these for my son's kindergarten teacher for Christmas and it was a big hit. I also got very positive feedback when I posted photos of my finished project on Craftster.org, everyone loves it. what a thoughtfull gift, sure to be appreciated! garden gloves for her gifts. She wanted to give advil or tylenol in a happy sometime. Can you give me a saying that would work for it!! Special Needs teacher. They are wonderful ideas. I am appalled at the "teacher" who said gift cards or money should be given as teacher appreciation! And, she calls herself a teacher. With that kind of mentality, I certainly would NOT want her teaching for me or any of my children. Shame on you! I just wanted to say that as a teacher I love this idea. I am disappointed in the person that said that teachers need gift cards and money as presents. Don't get me wrong, as a poor young teacher myself it is nice to have gift cards to stores where I can get more supplies for the kids, but a present like this means so much more!! How thoughtful, and what time you put into this project. This gift shows appreciation, it shows that you took the time to go above and beyond like great teachers do everyday. Bravo! This was well thought out and would have definitely placed a smile on my face. I am a first grade teacher at a Charter school and all we got was a thanks for the Cinco de Mayo presentation. Then one of our parents spoke to the principal and you want to know what he said? he said that we knew we were appreciated! WOW! seriously, but then what made it worst is a crappy envelope we got with 2 supposed day cruise tickets, here's the catch to the tickets, does not cover a 13 dollar departure fee for each person and 2 drink minimum for each person as well....We all were bummed out and just left them lying around or they accidently fell on our way down the halls....so much for our appreciation right? Thanks for all the great ideas. I am a member of our schools PTO. We give the staff of 44 a small treat each month of school on a rather limited budget. I have adapted a couple of your ideas recently. The Valentine Lollipop Lilly for the month of April... "thanks for helping our students bloom". Today was a staff meeting and each staff member received a bottle pop card with the clever "soda" message and a note that soda would be available at the meeting compliments of PTO. I have a few other ideas I've used I would be happy to share. Email me and I'll send the information. Thank you! Thank you so much for the great idea. I know my kid's teachers are going to love it! Why are you not doing a tv show by now!?!? You are so creative! This is ADORABLE!!! So clever and creative. I'm going to tell my friends about it, and we'll have a pill-box making party! My wife and I were just discussing an end-of-the-year teacher's gift idea from our kids, and this is excellent! @Deborah: Teachers get inundated with gift certificates and gifts with "#1 Teacher" on it. I don't know many teachers that wouldn't love to receive something like this. Are you freaking kidding me? 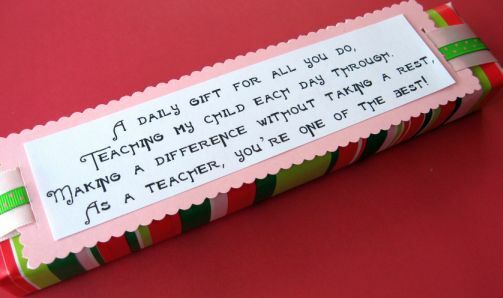 Poor teachers give something they can use like a gift cert or money that will show how much you appreciate them! 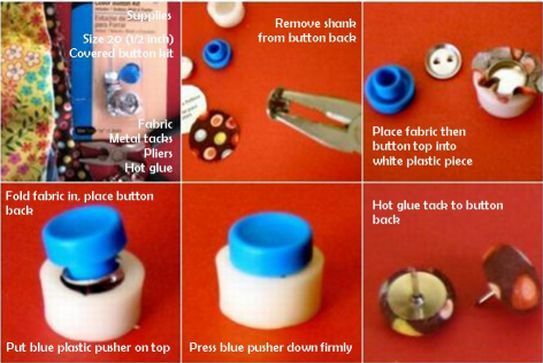 The craft is great to do with your children for fun or top make for a family member. 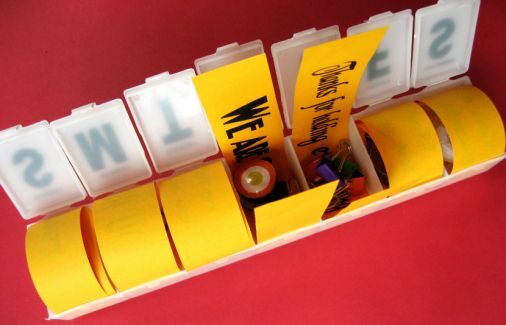 Teacher Appreciation pill box idea is adorable!! i have all ready planned my week but will also use this pill box idea. Just an idea to share with everyone...i had all of the students write their name on a sheet of paper then i used carbon paper to transfer it to a flower pot. Then i took a black paint pen and wrote on top of the traced name and will give this to the teacher with a plant inside!! on the rim of the pot i will write something about how she made our children blossom?!? if anyone has an idea for my flower pot let me know!! thanks, and have a happy week!! Thanks again!! LOVE this! In fact, I think that I might have my first graders to make something similar for Mother's Day! Thanks for the great idea! I love this idea too! My son doesn't have any teachers yet, but I was a teacher, and I would have loved it! I think I might convert it into a grandmother gift. Sooo cute! Thank you for sharing! Wow, you have inspired me! My daughter has the best teachers in the world and I try to let them know they are appreciated. This just blows me away. I am stealing this idea! Thanks for a wonderful blog - it never fails to brighten my day. I WILL be using this! Super! What a wonderful idea! Could be used for secretaries too! Hey, I found your site through Blissfully Domestic. Awesome Idea! I will definitely be using this for my daughter's teacher! That is so sweet! Thanks for sharing the idea! I was just wondering yesterday when I needed to get on that! Aidin has a field trip on the ACTUAL teacher appreciation day. That should be fun. Thanks for the weath of ideas you always provide, Cindy! This is really lovely. Lucky teachers to have your child in class. This is SOOOOO clever! My mom is a teacher, I think I'll do this as a "just because" for her. Thank you for all of the instructions and ideas. Nice ideas on teacher appreciation week. this is really cute. any teacher would love this. Awesome. You are so clever! Once again you have outdone yourself with the original ideas! Love these! I'll be linking these for sure! What a sweet gift. I hope I have parents like you when I get my first teaching job next fall! so freaking crafty and thoughtful- I would have freaked out at a gift like that when i was teaching! bravo!